Featuring Ken and Louise from Wendy Clarke's One on One video series, this video exchange encompasses a shared passion for music and pure emotional vulnerability that creates an incredibly intimate relationship between these two strangers throughout the project's evolution. Their connection is palpable, leaving the viewer envisioning a possible real life encounter between the two outside of the realm of this project. One on One is a series of video dialogues between the inmates at California Institution for Men in Chino, California, the members of the Church in Ocean Park in Santa Monica, California, and a group of Crenshaw residents in Los Angeles, California. One on One was produced while Wendy Clarke was the artist-in-residence at the California Institution for Men in Chino, California. The series uses the medium of video as a means to form relationships between people who would otherwise never get a chance to communicate with each other. 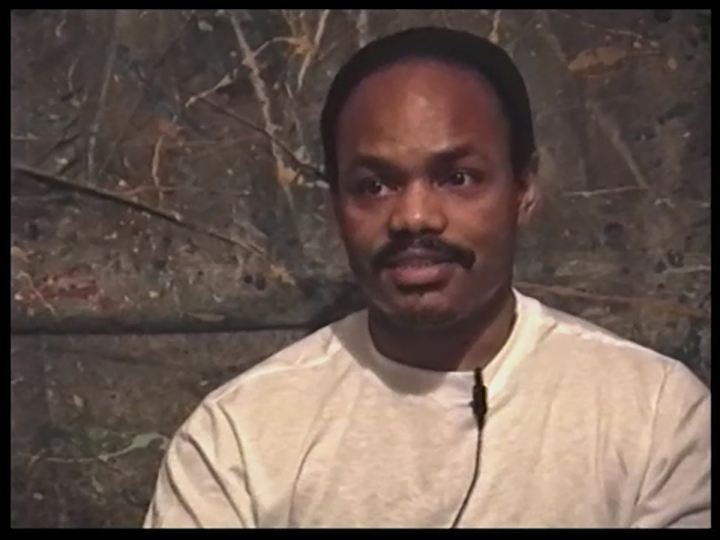 Clarke held a video workshop where inmates from the prison made videotapes introducing themselves to strangers on the outside. The collaborators from Crenshaw and the Church in Ocean Park then created their own video responses. Throughout 1992, fifteen pairs of people communicated via this inside/outside process. The inmates and the outside contributors were to keep their dialogue only to video, never in person or through letters, in hopes of creating a pure video experience for the strangers to exchange.